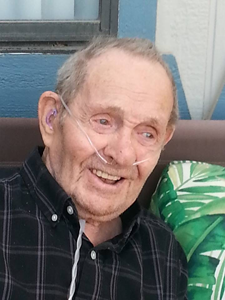 Frank “Scotty” McAdam, 97 of Casper, passed away Sunday, October 28, 2018 at Central Wyoming Hospice in Casper, WY. Scotty was born December 17, 1920 in Frannie, Wyoming. He went to school in Cut Bank graduating in 1940. For most of his life he worked in the Oil Fields. He entered the Army Air Corps in 1943 and was honorably discharged in December of 1945. Survivors include daughters, Rae (Don Townsend) McAdam, of Delta, Colorado, Dale Delph of Billings, Montana, Jeri (Gayle) Brabetz of Casper, Wyoming, and Son, Calvin (Pauline) McAdam, of Powell, Wyoming, grandchildren, Michael (Lorie Sodders) McAdam, of Casper, Wyoming, Jamie (James) Demmitt, of Commerce City, Colorado, Jason (Stacy) Shellabarger of Bar Nunn, Wyoming, Heather (Charlie) Lawrence, of Powell, Wyoming, Heidi (Damien) Dicks of Powell, Wyoming, and great grandchildren, Kayla Albertson, Carson and Dayton Lawrence, Cambree and Dylan Dicks, Haylie and Atlys Shellabarger. He is also survived 2 brothers, Ted McAdam and Max McAdam; and sister, Mona Arnott, and many many nieces and nephews. He was preceded in death by his wife, Helen, his parents, Maude and Robert McAdam; brothers, Lloyd McAdam, Bob McAdam, Roy McAdam, Charles McAdam and Don McAdam; sisters, Mary Norton, Blanche Wadman, Glennette Duncan, and Annie Blair. The family requests memorials be made to Central Wyoming Hospice, 319 South Wilson Street, Casper, Wyoming, 82601 in Scotty's name in lieu of flowers. The family wants to sincerely thank the angels on earth from Central Wyoming Hospice for their loving care. A Funeral Service with Military Honors will be held at 11:30am, Friday, November 2, 2018 at Newcomer Casper Chapel, 710 East Second Street. Add your memories to the guest book of Frank McAdam. My thoughts are with all of you as you say goodbye to Scotty. He has always been a favorite of mine. Gods Blessings be with everyone. To the family of Scotty McAdam I extend my deepest sympathy on your loss. Hold fast to your faith and your most cherished memories of Scotty to see you through the days ahead. He was a blessing to so many. God bless and keep each of you. I will forever remember your smiling face,your attitude.Fly high mister Scotty.God gained a righteous man.He loved to sing to us. ?Twylla Egan( CNA)at parkplace.